It's hard to beat the taste of a rotisserie chicken that's roasted until it is so tender that it's falling off the bone. Rotisserie chicken offers a tasty alternative to fried chicken and has less fat. The Ronco Rotisserie is a countertop oven with a distinct advantage over some other brands because it offers a flat spit basket that allows you to cook foods like chicken breasts to rotisserie perfection. Thaw the chicken breasts in the refrigerator if frozen. If thawed, your chicken will cook more evenly. Trim any visible fat and excess skin from the chicken breasts. Larger portions of fat may not cook completely in the relatively short time needed for cooking. You can remove the skin afterwards, but leave it on to cook and to prevent the meat from drying out. Season your chicken breasts. You can use a spice rub over the entire piece of meat. If you prefer, you can also work a small pat of butter under the skin to baste the meat as it cooks. Salt and pepper the chicken breasts if you're not using a spice rub. Spray the cooking breasts with cooking spray. This will help prevent sticking as well as help the seasonings adhere to the meat. Spray the flat spit basket on the top and bottom with cooking spray as well. Place the chicken breasts in the basket, allowing for space in between the pieces. This will help the warm air of the oven circulate. Put the drip pan in the rotisserie oven. As the chicken cooks, fat will drip off the meat onto the pan for easier cleanup. Snap the basket closed and place in the oven on the spit rods and into the spit wheels on either side. Set the oven for normal rotation. The Ronco Rotisserie does not have an adjustable heat setting. Set the time for 25 minutes. Check the temperature of the chicken breasts with an instant-read thermometer after the timer goes off. 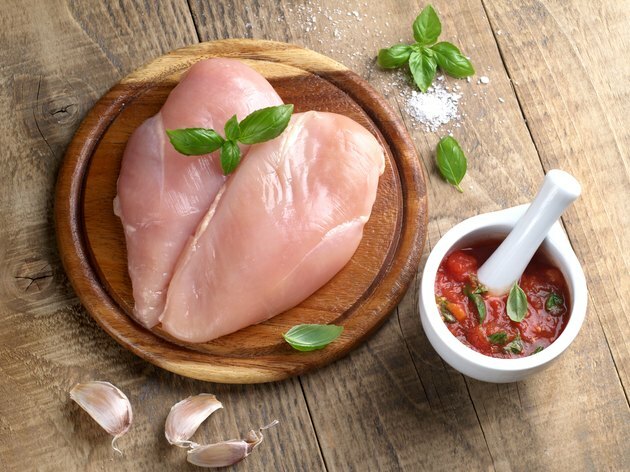 For chicken, the USDA Food Safety and Inspection Service recommends an internal temperature of at least 165 degrees F.
Leave chicken breasts in the oven a few minutes longer if the temperature is less than 165 F.
Carefully remove the spit rods and flat spit basket from the oven when the chicken is done. Cover the chicken breasts loosely with aluminum foil while you prepare the rest of your meal. The chicken's internal temperature will rise a few degrees after cooking to ensure a safe meal. To make cleanup easier, line the drip pan with aluminum foil. Don't be concerned if the spit rods clunk as they rotate. As the oven heats, the metal will expand and the clunking sound will stop. When you remove the assembly, place it on a heat-resistant surface or in the sink. Refrigerate any chicken leftovers within two hours to avoid harmful bacteria growth.